Then his girlfriend looked at me. Once Andy and I assured them, through whole-body convulsing shivers, that we were indeed okay without their generous offers I dropped the bombshell. Here’s a confession – I can never get it completely together. Maybe no one can, but I suppose it always seems more obvious when it’s you. Sometimes I can fake it but I have a finite amount with-it-ness and once that’s used up, it’s all downhill and damp bathing suits from there. I used to fake it pretty well but now that we’re toting two toddlers around the world with us, guess who gets a little neglected? It’s me. It’s me and it’s Andy and it’s whoever else doesn’t break down into little balls of emotion if they’re hungry, tired or cold. 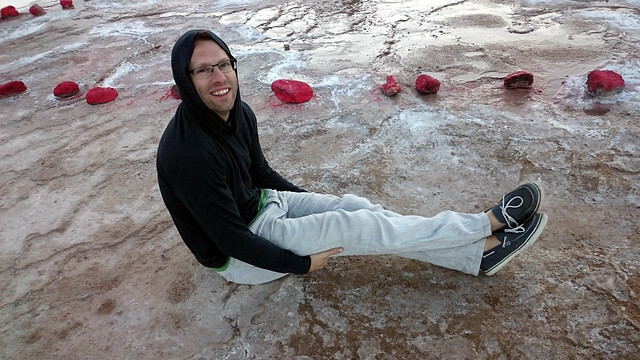 So that is how it was me who ended up in freezing cold temperatures in the Andes Mountains before sunrise wearing a wet swimming suit under my clothes. Lest you think I’m exaggerating about the cold temperature, here is a picture of some fellow travelers. They’re so bundled up. They’re in, like, actual cold weather gear and plenty of them were STILL cold! Neither of us have real coats. Neither of us have hats. Neither of us even have socks. But hey, I wasn’t in flip flops so that felt like a win. It was in Chile and it was probably our earliest date on record. The shuttle left our hotel at 4:30 AM and my mom had offered to stay behind with the girls. We went up, up, up into the mountains and our driver, in broken English, warned us that if anyone started getting a headache to please speak up quickly because most likely, our heads would explode. I don’t know much about altitude sickness and rapid elevation but while I was sitting on that bus, sleepy and shivering, I sure did wish I’d Googled it ahead of time. 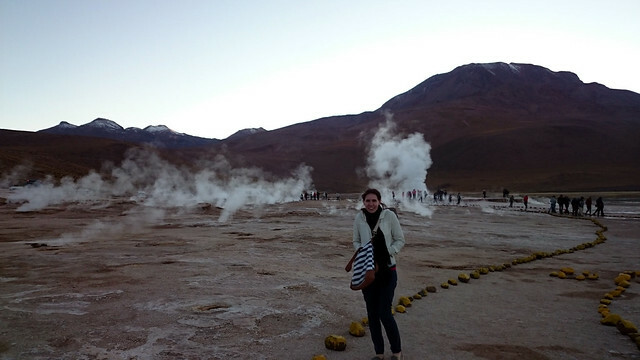 When we arrived at El Tatio geyser field, the highest elevation geyser field in the world, the sun was still behind the mountains. We all piled out of the van and into a cabin for breakfast where we bonded with our fellow travel mates over some really funny conversation about jelly and deli meat and a Bulgarian girl. Andy and I, the only Americans, lacked the insight into the nuances of European cultures and didn’t get it but we laughed anyway and our friendships for the day were sealed. 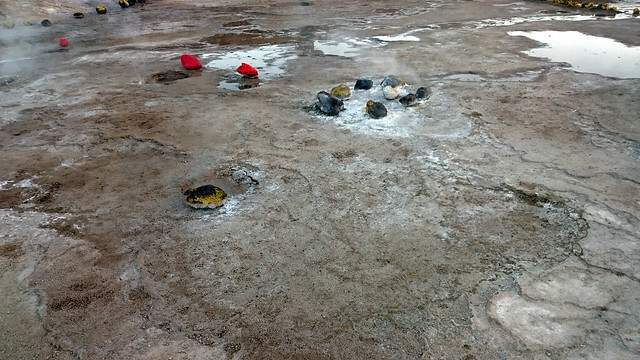 In the cabin, they briefed us on the hazards of the geyser field and that the people who die are usually ones who aren’t following the rules. Said rules were thankfully pretty simple: stay behind the rocks that mark the trails, red rocks mean really dangerous and unpredictable geysers and yellow ones less so. Most the trails were pretty easy to decipher, like this one. But of course there’s always got to be that one person who breaks the rules. Okay, rules and potential death aside, you’re probably wondering why on earth I opted to wear a swimming suit under my clothes. 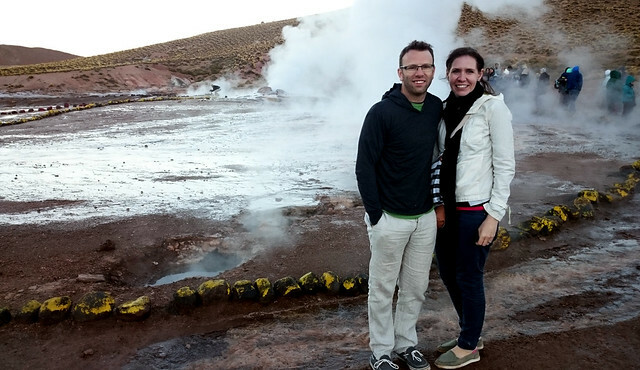 The reason was because after the geysers, a visit to a thermal pool was on the docket. So actually, underneath all those layers of long underwear and down coats, a lot of the other girls were also wearing swimming suits. I was, however, the only one we met whose suit was still damp. Probably this is due to the fact that we were all staying in the middle of a very hot and dry desert and it would have taken only five minutes and one ounce of foresight to dry it out ahead of time. So why was mine wet, you ask? Well, poor planning, that’s why. It had only been the afternoon before that we’d gone to swim in the salt-saturated lake (read about it here) and instead of any attempts to dry my suit, I’d hastily hung it in the shower before attempting to wash all that salt off Paige and Millie. I don’t believe I’d even rung it out; way to go me. Then, at 4 AM the next morning, while surely regretting everything, I had to put it on and strike out into the cold, dark streets to catch a shuttle. And there you have it, my travel fail. Being freezing cold in the middle of a field with tons of scalding water is a cruel kind of irony. Obviously we didn’t want to boil, but we did attempt to safely harness some of the intense heat that surrounded us. 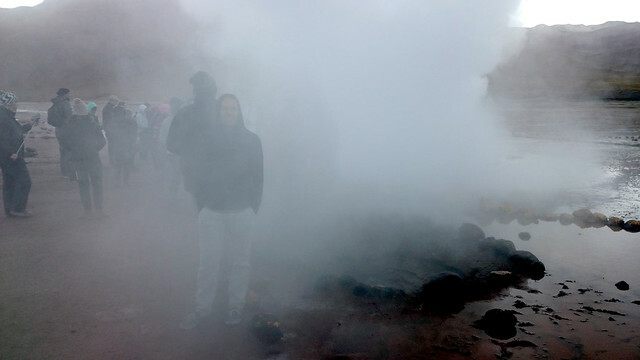 First we tried to position ourselves in the hot steam. This tactic worked great until we moved locations and were just left with damp clothes. It was a real instant gratification vs. long term happiness type of conundrum. Then Andy decided sitting on the steaming hot ground might do the trick. Which it did, but it also made people stare at us. Was it warm? Yes. Was it weird? Yes. 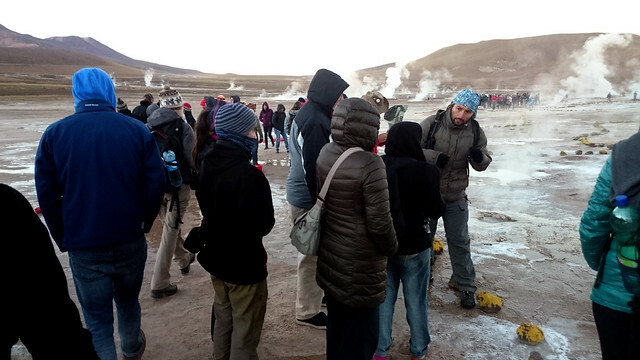 Through all the shivering and explaining our poor sartorial choices to people who were genuinely worried about our well-being, and probably our sanity, the Tatio Geysers were really stunning. I blame everyone caring so much on the fact that they probably felt like kindred spirits after we’d all shared such a hearty laugh over that jelly/deli meat joke. Damn us for being so fraudulently jovial. 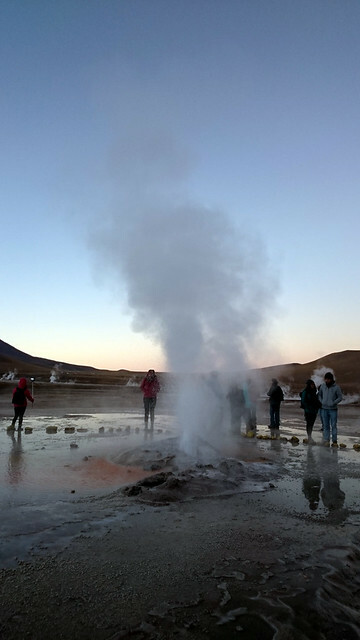 Despite being so cold, the geysers were pretty incredible, especially seeing them at daybreak when the high-rising steam is highlighted by air’s freezing temperatures. There are over 80 of them, some big, some small, some loud and unpredictable and some who probably have been softly gurgling quietly for years. 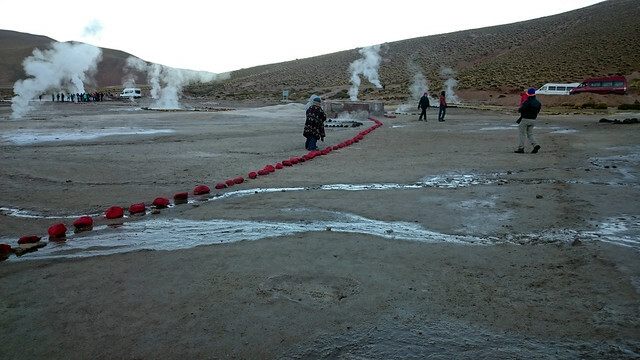 Luckily, once the sun rose, it started to warm up and we were off to finish out our excursion in some hot springs. I’ll leave that to another blog post though because it also includes a story about how we ended up lying flat on our backs in the middle of a desert highway. 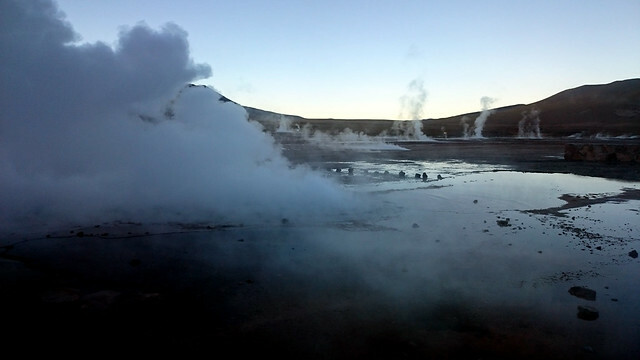 For now, I’ll leave you with these last few images of the beautiful geysers.